My son plays sports. I’ve realized that sports are a good illustration of life in so many ways. Probably the biggest illustration is that if you continue to practice something, you will get better and better at it. Let’s talk about weight lifting. When you start lifting weights, you choose a light weight. As you work out, you start to increase the amount of weight. You keep making the choice to work out; therefore you become stronger, needing heavier weights. You also know that if you stop making the choice to work out, you are not going to be as strong as you used to be. This same concept applies to lust. If you choose to lust again and again, then over the years you become better and stronger at lusting. You get so good at it that you no longer need a person or image in order to lust. You can create images in your mind to lust after even when driving. This ability takes lots of practice, focus, and discipline. 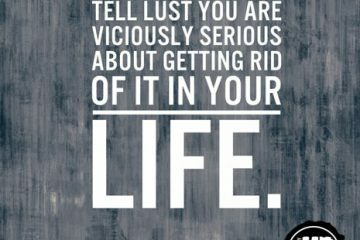 When you choose a lust-free lifestyle, you start to become weaker at lust. You start to see a woman who is screaming to be lusted after and feel sad for her. You begin creating strong, lust-free muscles, thoughts, and beliefs. Here’s the good news: Since you’re in charge, you get to choose how you get stronger and better. 1. Why do you believe that the choice of practice makes you better or stronger? Give examples from your life. 2. What are your thoughts about practicing lust? 3. How do you feel (feeling words) about being able to actually choose how you are strong, lusting or not lusting? 4. Are you willing to undergo new disciplines, thoughts, and behaviors to be lust-free? 5. What percentage are you willing to do these new things in your life so you can live lust-free (1%-100%)? 6. Why did you choose that percentage?